Having witnessed the way in which they try to manipulate you and the inaccuracies of the media about our experience here in Spain, I’ve decided to write to you. The news about your struggle is being distorted by the media before it reaches us in exactly the same way as during the 15M movement, and as it usually is with all r-evolutions. I’m writing to offer some notes that I’ve picked up along the way of my experience, with the hope that it might be useful to avoid the pitfalls that we fell into and that they could help taking your movement further than we managed to go. I'd like to talk about what lessons people took away from our experience in Spain. I’m sure that your opinion will have been tainted somewhat by the omnipresent image of Podemos. Clearly, Podemos should not be an objective: nor should it be an example to follow. Podemos does not represent the transformation that 15M symbolised, despite co-opting ideas from the experience. Not only is Podemos not something to strive for, it is the worst possible outcome for the Indignados movement and for 15M. And you shouldn’t be surprised that it isn’t an example: the majority of its founders weren’t in the squares when 15M took place and have no idea what was really happening. 15-M, May, 2011.Flickr/InnMotion Simona Levi. Some rights reserved. Sooner or later, it’s inevitable that a good number of you will come to the conclusion that we need to take over the institutions, and not in the sense of becoming a part of them, but of being capable, as citizens, to govern ourselves. No doubt, we can’t govern ourselves from the squares of cities and towns, and, at the same time we can’t leave the structures and the money that is used to manage all of our lives, from our jobs to housing, as well as common resources such as schools, hospitals, energy, security, infrastructure, and more, in the hands of the system. For this reason, sooner or later, inevitably, there will have to be a conversation about which devices will have to be organised to take over positions of power, and who should manage them. (1) decentralization and a distributed leadership according to expertise, not according to media visibility; these new ways of organising will overcome the limits of the horizontal governance of assemblies and will transform into networks. (2) Our abilities, well above those of the institutions and political parties, to resolve specific problems with specific solutions that are derived from the specific experiences and expertise of each of us, and not from ideologies. It’s about collaboration between people with different skills and abilities, not about merging under a single banner or a unique trade mark. The strength of a federation based on diversity. (3) Shared responsibility: we want grown-up, adult societies that don’t need a parental figure whose proclamations are fanatically observed, or in the same vein, a leader for whom we are the critical current, and who we legitimise ‘democratically’ through our disagreements. We’ve already got that; we’re already the critical current of a system that doesn’t work. We, citizens, organised in groups by our abilities, interests and expertise, we can direct the governance of our lives together. What structures such as Podemos are seeking is nothing new: to co-opt our collective efforts so that they can control the reins of power and send us home again. The dogmatic left has always done this; it’s nothing new. In Spain, PSOE (Socialist Workers’ Party) did so after the dictatorship, and then came Izquierda Unida (the United Left) in the ninety’s, and now it’s not only the CRS (police) that wants to send the Indignados home, Podemos does as well. It’s ok to leave the squares and to go to other places: to your neighbourhood, to the workplace, to the internet, to courtrooms, to Europe, or anywhere you must be to fight (we can’t stay in the squares forever after all); but we need to make sure that our fight does not go back home. In this sense, Podemos could do more harm than the CRS. In contrast, we can build leadership networks based on expertise (groups or nodes that focus on topics such as labour and renters' rights, education or economics), in which one of the nodes is responsible for institutions. This is the no-political-party way, the opposite of an all-encompassing structure. This means that a party is nothing more than one node amongst others, and as such it isn’t any more important than the others, and, above all, it doesn’t focus on issues that don’t fall within its scope. Political parties should only grant access to institutions for solutions designed by organised groups from civil society. These forms exist in Spain. The first, and my favourite because I helped to create it : ), is the X-Party (http://partidoX.org), but working along the same lines are EnComú, which govern Barcelona, Marea in Galicia, CUP in Catalonia and more. These are devices, mechanisms, projects that propose to occupy institutions in the service of an active, organised and mobilised society that doesn’t have to surrender its identity, and which puts solutions into practice through governance. Without the false idea of digital participation (the opiate of the masses), but with the real participation of organised citizens on land, at sea and in the air, and, of course, online without any party mediation. Structures like Podemos are exactly the opposite of this, but they rise easily since the system adores them, and, when we radically apply pressure to a system, they are needed so that everything can go back to normal. Podemos doesn’t recognise any civil society group that hasn’t accepted “affiliation”. They erase the issues of unaffiliated groups and appropriate their work. The result, as you might expect, is more of the same: a r-evolutionary process that comes back into the system as a party -> a party that simulates being a movement, but which is centralised, uniform and based on a lack of critical spirit and an ample, passive, and dependent majority. Nothing new, really. For this reason, I think the only possible step forward for the struggles of new r-evolutions is the combination of groups, all working on the same level, which will dedicate themselves to opening institutions, and to nothing else, along with civil society groups organised to solve different problems. 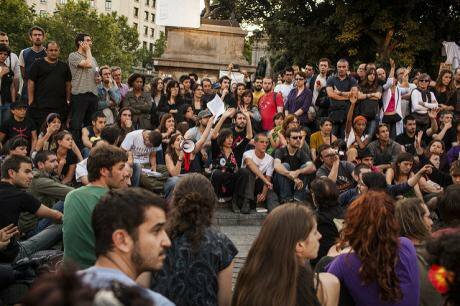 Despite the fact that Podemos has tried to silence all other voices with its constant and monolithic media presence (Podemos is basically a product of television), 15M/Indignados continues in Spain, in cities such as Barcelona, A Coruña, Madrid, and many others, where its members are working to insert permanent solutions, derived from civil society, into institutions for collective problems, through groups like PAH (Platform for Persons Affected by Mortgages), which works on housing, or 15MpaRato, which focuses on corruption. The effort is enormous because Podemos, and the idea of Podemos that has been created by the press, keeps public opinion from noticing that we are moving forward thanks to 15M: we’ve achieved new policies on housing, transparency, public debt, we’ve advanced on the issue of healthcare, and we’ve shaken up webs of institutional corruption. I’m writing you with the hope that you won’t allow a “Podemos” to steal your imagery and your actions only to once again bind them within the corsets of a magnificent leader and an adolescent citizenry. I wish you strength in your struggle - we haven’t finished yet but we’ll get there.